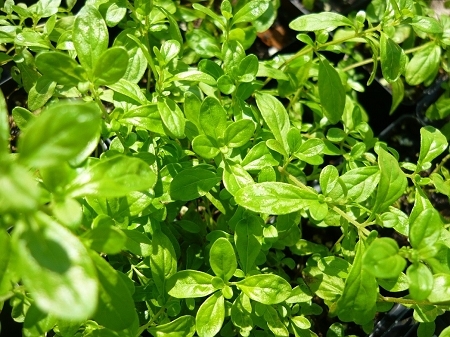 Jamaican Mint (Micromeria viminea) - Interesting tropical mint variety features small rounded green leaves with a spicy peppermint scent. Used in tea and to flavor meats and dishes in Jamaica and the Caribbean. Small compact growing plant excellent in containers. Perennial zones 9-11. Tropical plant cannot safely ship during extreme cold temperatures. Live plant in 3 inch container. Growing up in Jamaica, we had peppermint tea at least once a week. This plant is the same species I knew back then. Plant came nicely packaged and thrived well throughout the year in the container I planted it in. My plant died in the winter when I forgot to take it inside on a night that dipped to near freezing. I have since ordered this again and will probably just keep it indoors all winter.